Arguably the most modern of Central American cities, Panama City boasts a shimmering skyline of glass skyscrapers. Do some cultural sightseeing at Casco Viejo and Panama La Vieja. Gatun Locks and Iglesia del Carmen will appeal to history buffs. There's still lots to do: make a trip to Panama Canal, get to know the fascinating history of Avenida Balboa, examine the collection at Museo Panama Viejo, and explore the striking landscape of Metropolitan National Park. To find traveler tips, reviews, photos, and tourist information, use the Panama City itinerary builder site . Toronto, Canada to Panama City is an approximately 9-hour flight. You can also drive. Traveling from Toronto in February, expect Panama City to be much warmer, temps between 37°C and 28°C. Wrap up your sightseeing on the 7th (Thu) early enough to travel to Manuel Antonio. Relax by the water at Playa Manuel Antonio and Palo Seco Beach. Visiting Playa Biesanz and Playas Gemelas will get you outdoors. Go for a jaunt from Manuel Antonio to Dominical to see Alturas Wildlife Sanctuary about 1h 05 min away. Make the 11th (Mon) an awe-inspiring day at Naturalist Michael Araya Flores. Spend the 9th (Sat) exploring nature at Manuel Antonio National Park. And it doesn't end there: relax and float downstream with a rafting and tubing tour, get interesting insight from Tours, relax in the rural setting at Villa Vanilla / Rainforest Spices, and glide through the air with a parasailing or paragliding tour. To find maps, where to stay, other places to visit, and more tourist information, use the Manuel Antonio trip maker app . 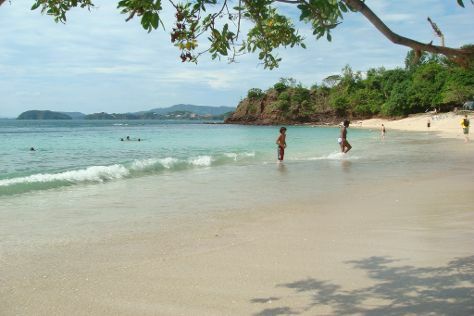 You can do a combination of flight and bus from Panama City to Manuel Antonio in 8.5 hours. Alternatively, you can drive; or do a combination of bus and taxi. The time zone changes from Eastern Standard Time (EST) to Central Standard Time (CST), which is usually a -1 hour difference. Wrap up your sightseeing on the 14th (Thu) early enough to drive to Tortuguero. One of Costa Rica's least accessible destinations, Tortuguero sits within an eponymous national park and remains accessible only by plane or boat. Kick off your visit on the 15th (Fri): explore the striking landscape of Tortuguero National Park. Here are some ideas for day two: see the interesting displays at Sea Turtle Conservancy and then get a new perspective on things with Tortuguero Adventures. To find where to stay, reviews, ratings, and tourist information, use the Tortuguero day trip planning app . Traveling by car from Manuel Antonio to Tortuguero takes 5.5 hours. Alternatively, you can do a combination of bus and taxi; or do a combination of bus and shuttle. 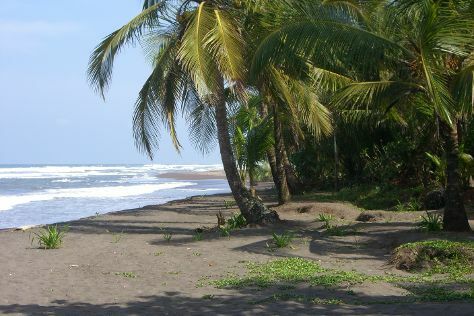 In February in Tortuguero, expect temperatures between 34°C during the day and 24°C at night. Wrap up your sightseeing on the 16th (Sat) early enough to drive to La Fortuna de San Carlos. Set against the backdrop of the imposing Arenal Volcano, La Fortuna de San Carlos offers visitors a chance to explore diverse natural landscapes and sample some delicious local produce. Get outdoors at Tabacon Hot Springs and La Fortuna Waterfall. 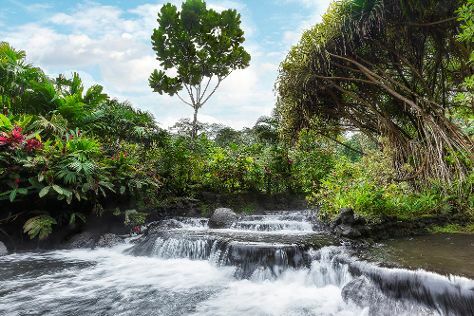 Change things up with these side-trips from La Fortuna de San Carlos: El Castillo (Butterfly Conservatory & Arenal Eco Zoo). Next up on the itinerary: get impressive views of Arenal Volcano (Volcan Arenal), scramble along the landscape with a canyoning and rapelling tour, take in the natural beauty of Ecotermales Fortuna, and take a pleasant ride with a tour on horseback. To find photos, traveler tips, where to stay, and more tourist information, go to the La Fortuna de San Carlos trip itinerary planning site . Getting from Tortuguero to La Fortuna de San Carlos by car takes about 3.5 hours. Other options: take a shuttle; or do a combination of taxi and bus. Finish up your sightseeing early on the 24th (Sun) so you can go by car to Monteverde. Monteverde is all about natural attractions, not surprising for an eco-tourism hotspot known for its cloud forests and rich diversity of animal life. Get in touch with nature at Monteverde Cloud Forest Biological Reserve and Reserva Bosque Nuboso Santa Elena. 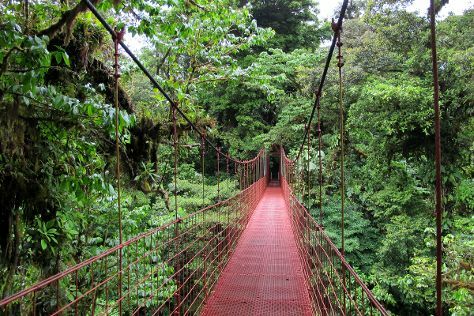 The adventure continues: kick your exploration up a notch at some of the top local zipline courses and adventure parks, stop by Hummingbird Gallery, identify plant and animal life at Monteverde Frog Pond, and snap pictures at Santa Elena Skywalk. To see traveler tips, photos, other places to visit, and more tourist information, read our Monteverde vacation planner. Drive from La Fortuna de San Carlos to Monteverde in 3 hours. Alternatively, you can take a shuttle. Finish up your sightseeing early on the 27th (Wed) so you can go by car to Playa Conchal. Relax by the water at Playa Conchal and Nosara Beach (Playa Guiones). Escape the urban bustle at Tamarindo Beach and Playa Hermosa. Explore Playa Conchal's surroundings by going to Playa Avellana (in Playa Avellanas), Rojas Bros Boruca Indigenous Arts (in Playas del Coco) and Playa Dantita (in Las Catalinas). Plan a trip to Playa Conchal easily and quickly by telling Inspirock to suggest an itinerary. Getting from Monteverde to Playa Conchal by car takes about 3.5 hours. Other options: do a combination of taxi and bus; or take a shuttle. Wrap up your sightseeing on the 4th (Mon) to allow time to travel to Antigua. The former capital of Guatemala and a World Heritage Site, Antigua retains its colonial charm and remains one of the most visited destinations in the country. Get some cultural insight at Volcán Pacaya and Palacio Nacional. Popular historic sites such as Convento de las Capuchinas and Casa Popenoe are in your itinerary. You'll find plenty of places to visit near Antigua: Guatemala City (La Aurora Zoo, Museo Popol Vuh, & more). There's much more to do: pause for some serene contemplation at Iglesia de La Merced, get engrossed in the history at Casa Santo Domingo Museums, look for gifts at Nim Po't Centro de Textiles Tradicionales, and contemplate the long history of Church of San Francisco. For photos, maps, and more tourist information, refer to the Antigua trip itinerary builder website . Explore your travel options from Playa Conchal to Antigua with the Route module. In March, daily temperatures in Antigua can reach 30°C, while at night they dip to 13°C. Finish your sightseeing early on the 10th (Sun) to allow enough time to travel to Tikal National Park. Take a trip to Tikal National Park and discover an ancient city in the thick tropical jungle. On the 11th (Mon), delve into the distant past at Tikal. Plan my day in Tikal National Park using traveler tips and tourist information provided by Inspirock. Traveling by combination of shuttle and flight from Antigua to Tikal National Park takes 5.5 hours. Alternatively, you can do a combination of shuttle, flight, and car; or drive. Wrap up your sightseeing on the 11th (Mon) early enough to drive to Cayo. Holidays in Cayo offer adventure and history in equal measure, with a wealth of ancient sites and unspoiled environment to explore. Get a sense of the local culture at Xunantunich and Caracol. Get in touch with nature at Cockscomb Basin Wildlife Preserve and Actun Tunichil Muknal. 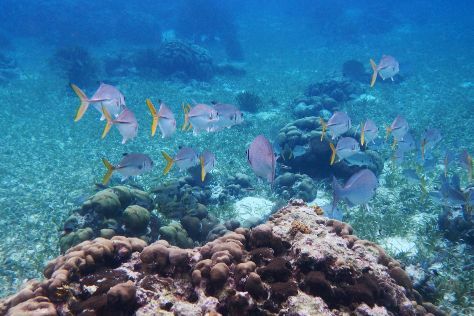 Change things up with these side-trips from Cayo: Half Moon Caye National Monument (in Glovers Reef Atoll) and The Belize Zoo (in La Democracia). Spend a day outdoors on the 17th (Sun) with Ian Anderson's Caves Branch Adventure Company. The adventure continues: look for all kinds of wild species at Green Iguana Conservation Project and delve into the lush surroundings at Mountain Pine Ridge Forest Reserve. To find more things to do, traveler tips, other places to visit, and more tourist information, you can read our Cayo trip planner. Getting from Tikal National Park to Cayo by car takes about 3.5 hours. Other options: do a combination of bus and car. In March, plan for daily highs up to 34°C, and evening lows to 26°C. Finish your sightseeing early on the 17th (Sun) so you can travel to Caye Caulker. At just under 8 km (5 mi) long and 1.6 km (1 mi) wide, the limestone coral island of Caye Caulker offers a small but perfectly formed getaway 32 km (20 mi) offshore from Belize City. Kick off your visit on the 18th (Mon): step off the mainland to explore Caye Caulker. On the 19th (Tue), you'll have a packed day of sightseeing: kick back and relax at The Split and then discover the deep blue sea with a scuba or snorkeling tour. To find other places to visit, ratings, photos, and other tourist information, refer to the Caye Caulker trip builder app . Do a combination of car, bus, and ferry from Cayo to Caye Caulker in 5 hours. Alternatively, you can do a combination of car, flight, shuttle, and ferry. In March, daily temperatures in Caye Caulker can reach 34°C, while at night they dip to 26°C. Finish up your sightseeing early on the 19th (Tue) so you can travel to San Pedro. San Pedro evolved from small fishing village and now represents one of the most visited locations in Belize. Get outdoors at Hol Chan Marine Reserve and Fishing Charters & Tours. When in San Pedro, make a side trip to see River Rafting & Tubing in Belize City, approximately 2 hours away. Spend the 22nd (Fri) exploring nature at Bacalar Chico National Park and Marine Reserve. And it doesn't end there: get a new perspective on things with Boat Tours & Water Sports, explore the striking landscape of Marco Gonzalez Maya Site, get outside with La Gaviota, and explore the gorgeous colors at Shark Ray Alley. Use Inspirock's suggestions to plan your San Pedro trip and find the best activities and attractions for your vacation. Traveling by combination of ferry, shuttle, and flight from Caye Caulker to San Pedro takes 3.5 hours. In March, plan for daily highs up to 34°C, and evening lows to 26°C. Wrap up your sightseeing on the 26th (Tue) early enough to fly to Roatan. The largest of the Bay Islands, Roatan is the most developed and the most popular among its neighbors. Visit West Bay Beach and Sandy Bay Beach for some beach relaxation. Step out of the city life by going to Scuba & Snorkeling and Tabyana Beach. There's much more to do: whizz through the canopy at some of the top local zipline courses and adventure parks, contemplate the waterfront views at Half Moon Bay, take in the exciting artwork at Rusty Fish, and look for gifts at Stone Castle Cameo Institute. For other places to visit, photos, reviews, and other tourist information, read our Roatan attractions planner. Fly from San Pedro to Roatan in 2.5 hours. Alternatively, you can do a combination of shuttle and flight. 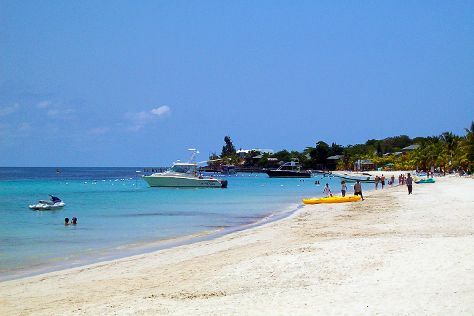 March in Roatan sees daily highs of 35°C and lows of 26°C at night. On the 1st (Mon), wrap the sightseeing up by early afternoon so you can travel back home.